SEB’s economists have cut their growth forecasts for both the Swedish and the global economy in the latest edition Nordic Outlook. Bottlenecks in the labor market, political uncertainty and fluctuations in the financial markets are behind the slow-down. These forces are however not strong enough to trigger a recession. The real economy and the financial markets are now interacting in a way that is typical in the late phase of an economic cycle. Investors are especially sensitive to any negative news that boosts the risk of a recession and thereby radically changes the potential for corporate earnings. For their part, economic analysts must take into account to what extent financial market turmoil will impact the real economy. One channel may be that such turmoil signals a decline in profits and lower future investments. Another link may be that falling asset prices weaken balance sheets and wealth positions in a way that will hamper consumption and capital spending by households and businesses. SEB's conclusion is that the impact of financial market turmoil on the real economy is still not strong enough to trigger a recession. Instead, more dovish central banks can strengthen risk appetite to some extent, as exemplified by the recent rebound in market sentiment after the US Federal Reserve (Fed) signalled greater sensitivity to market worries. Unemployment in advanced economies (the 36 member countries of the Organisation for Economic Cooperation and Development, OECD) has fallen to its lowest since 1980, creating something of a dilemma for monetary policymakers. Although the rate of wage and salary increases has accelerated in all major economies, it remains at historically low levels. Underlying inflation pressures are still moderate. This enables central banks to further slow the pace of an already leisurely rate-hiking process. Underlying economic strengths, such as robust household balance sheets and plenty of job openings as well as the need for business investment due to high resource utilisation, may again make themselves felt. But the challenges from an increasingly stretched resource situation cannot be solved by monetary policy. Downside risks thus increase the further along in the economic cycle we move and as the uncertainty element of economic forecasts tips more and more to the negative side. SEB is lowering its global growth forecast by about another tenth of a percentage point to 3.5 per cent in both 2019 and 2020. This is still somewhat above trend and is enough to ensure a continued downturn in unemployment. In the United States, the economy will slow mainly due to increasing supply side restrictions, but rising labour force participation indicates continued room for expansion despite historically low unemployment. US economic growth will slow from a high 3 per cent last year to 2.4 per cent in 2019 and 1.7 per cent in 2020. In Western Europe the problem is instead generally weaker demand, but last year's slowdown was partly driven by temporary factors, especially in the automotive sector. Euro zone GDP growth will fall from nearly 2 per cent in 2018 to 1.6 per cent this year and then reach 1.7 per cent in 2020. Looser economic policy in China and a continued strong upturn in India will enable emerging market (EM) economies to continue growing at nearly 5 per cent yearly both in 2019 and 2020. Uncertainty due to the Brexit process (United Kingdom withdrawal from the European Union) is having ever-increasing negative effects on British growth, which will be stuck at around 1.5 per cent despite the weak pound. SEB's main scenario is still that a no-deal Brexit will be avoided. Key interest rate forecasts are being lowered. The Fed is now expected to be content with one further rate hike in mid-2019, leaving its federal funds rate at 2.75 per cent. SEB is also lowering its forecasts for Western European central banks by 25 to 50 basis points. A more dovish key rate outlook will have consequences for long-term bond yields. Ten-year US Treasuries are not expected to rise above 3 per cent again, and because of a cautious European Central Bank (ECB), German 10-year government bond yields will not climb past 0.70 per cent. The foreign exchange (FX) market lacks clear trends. Dollar-positive factors, such as US economic growth and the Fed's actions, will help keep the EUR/USD exchange rate at around 1.15 during the first half of 2019, but after that the dollar will weaken as other central banks begin their normalisation process while risk appetite remains decent. The Nordic economies are affected in varying degrees by euro zone deceleration. Norway is showing resilience to the slowdown in other countries and to lower oil prices. Capital spending in the petroleum sector will now increase markedly, adding to demand in the rest of the Norwegian economy. Together with a housing market rebound and solid private consumption, this will help GDP growth in the mainland economy (excluding oil, gas and shipping) accelerate to 2.5 per cent this year, with 2.2 per cent growth in 2020. Overall GDP growth will surge to nearly 3 per cent in 2019 and 2.5 per cent in 2020. Norges Bank can thus keep pursuing its plan to hike the key rate twice yearly in 2019 and 2020. Finland and Denmark will also enjoy some support from domestic strengths, such as robust labour markets, high capacity utilisation and a positive GDP growth contribution from housing construction. The Finnish economy has slowed down after its earlier acceleration, but growth will still reach about 2 per cent both this year and next. Temporary effects contributed to weak Danish economic growth in 2018: an underlying slowdown will gradually slow GDP growth to 2.0 per cent in 2019 and 1.7 per cent in 2020. After a strong 2018, the fast-growing Baltic economies will also decelerate somewhat, driven by lower export demand and by certain supply side restrictions. In Estonia and Lithuania, GDP growth will be nearly 3 per cent in 2019 and around 2.5 per cent in 2020. GDP growth in the Latvian economy will reach 3.5 per cent this year and 3.2 per cent next year. The growth outlook in Sweden has dimmed in recent months, with worrying signals from both the domestic economy and exporters - thus weakening the forces that can offset the sharp decline in home construction that is now under way. The GDP decline in the third quarter of 2018 was partly due to temporary factors, such as weak consumption caused by changes in auto taxation, but a broad retreat by sentiment indicators suggests a more wide-ranging slowdown. SEB now believes that Swedish GDP growth will reach only 1.6 per cent in 2019, compared to its earlier forecast of 2.2 per cent. In 2020 growth will recover somewhat to 1.9 per cent as the negative GDP contribution from home construction disappears from the statistics. 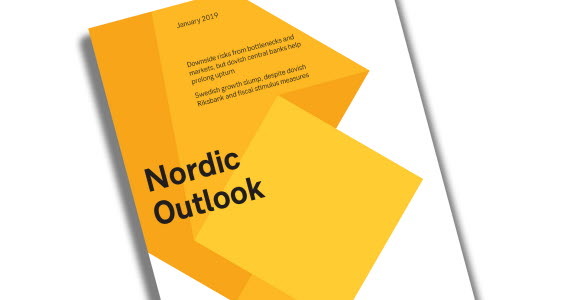 An expansionary fiscal policy, continued low interest rates and a weak krona suggest that an even more serious economic slowdown can be avoided. Because of the large supply of homes, especially newly produced units in major cities, home prices have not stopped declining. After last year's stabilisation, prices will fall by another 3-4 per cent this year, bringing the total downturn since the peak in 2017 to nearly 10 per cent. The labour market will enter a calmer phase, and unemployment will level out at around 6 per cent. Pay increases will remain subdued at around 2.5 per cent in the coming year and will not accelerate until new collective agreements are in place during the spring of 2020. Inflation will remain at around current levels this spring, due to high electricity prices, but will drop below 1.5 per cent in mid-2019. Continued decent global economic conditions and cautious key rate hikes by central banks in other countries suggest continued interest rate hikes in Sweden, but partly because of low inflation the Riksbank is easing its monetary policy a bit compared to its December rate path and will limit itself to one rate hike per year. At the end of 2020 the repo rate will thus stand at 0.25 per cent. This spring the Riksbank is expected to announce a continuation of its strategy of early bond reinvestments. It will thus continue to own about half of the nominal supply of Swedish government bonds. Because of the slow pace of rate hikes, interest rate policy will not be a major positive factor for the krona. The krona will appreciate, with the EUR/SEK exchange rate reaching 9.95 at the end of 2019 and 9.70 at the end of 2020. Swedish economic policy will move sharply in a centre-right direction as a result of the new budget cooperation agreement between the Social Democrats, Greens, Centre and Liberals. This policy represents a clearer reform agenda and will give the government a good chance to push through its budgets, but quarrels about broken political promises and internal tensions pose a latent threat. Fiscal policy will be somewhat more expansionary than earlier expected, but Sweden's public finances will remain strong in a European perspective.